Good choice: you're about to brighten your home with a beautiful handmade rug that will made just for you. Here's what you need to know. Before you do anything else, check that your rug is free from child labour. Does your rug manufacturer have GoodWeave certification? Check online or look for the GoodWeave label. The GoodWeave label is your best assurance that no children were involved in the creation of your rug. To earn the GoodWeave label, rug exporters and importers have to be licensed under the GoodWeave certification programme. They also have to sign a legally binding contract that they will adhere to GoodWeave's no-child-labour standard, allow unannounced random inspections by local inspectors, and pay a licensing fee that helps support GoodWeave's monitoring, inspections, and education programmes. Rug Couture is a GoodWeave licensee. Rugs are made from a wide range of materials: wool, New Zealand wool, pure silk, bamboo silk, and art silk (rayon), or any one of dozens of blends and mixes. This guide focuses on wool because it's by far the most popular rug material. Rug-buyers love wool because it's authentic, feels great, looks stylish, and wins on just about every criteria you can think of: sustainable, healthy, hard-wearing, energy-efficient, safe, easy to clean. The structure of wool makes it an ideal material for rug-making, which is why wool has such a long tradition of use as a floor covering. This rich heritage adds authenticity to a room. No man-made fibre can match it. 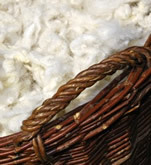 Wool has a high protein content, giving it a natural affinity for dye. When you choose wool, you get hundreds of colours to choose from; you can match it to any colour scheme in your home. Dyed wool offers exceptional depth and clarity of colour, two characteristics essential to a stylish finish. Because the colour is locked into the rug fibres, it can't be rubbed off by walking upon it or through the movement of furniture. A wool rug keeps its stylish good looks for longer. 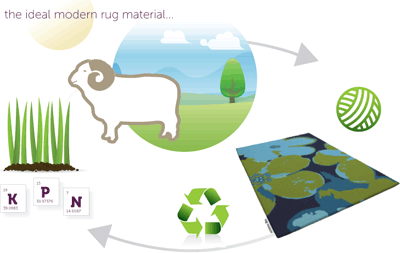 Wool is a supremely sustainable floor-covering material. The sheep from which it comes are an endlessly renewable resource made even more sustainable through flock rotation and good land management. At the end of wool's long and useful life, you can recycle it or return it to the ground where it breaks down naturally. Wool is a healthy choice for a home. It's non-allergenic, and does not promote the growth of bacteria or dust mites. In fact wool improves your living environment. It traps small particles of dust, pollen, and fungal spores, removing them from the air you breathe. If dust mites do gather in your rug, just lay it outside on a sunny day to let the sun's UV rays destroy them. No need for harsh chemical products or expensive treatments. Unlike synthetic fibres, which give off harmful toxins known as VOCs (volatile organic compounds), wool is entirely natural. Nevertheless, you should still check that your rug backing and adhesives meet stringent VOC standards. All Rug Couture rugs meet these standards. Wool is springy. Even when you stretch its fibres by more than 35%, they still bounce back to their natural shape. That's why wool rugs last for so many years without showing signs of wear and tear. Your investment in a wool rug is easily repaid. A wool rug is a good insulator. In winter, it slows down the loss of heat through an uninsulated floor; in summer it prevents heat rising from the floor. Since an uninsulated floor allows up to 10% of your heat to seep away, a wool rug could help you cut your heating bills. Wool stays clean for longer. A natural coating of light wax on each fibre makes it 30% more stain-resistant than even the best synthetic fibres. The wax coating also stops stains penetrating the wool. Instead dirt stays near the surface, which makes your rug easier to clean. No need for harsh chemical cleaners, just vacuum the dirt away. Wool is a natural flame retardant. The high levels of protein and moisture in wool fibres retard the spread of flame more effectively than synthetic fibres do. And when wool does burn, it emits less smoke, which means it produces lower levels of carbon monoxide and other toxic fumes. All that natural moisture has other advantages. It makes wool resistant to static electricity and it reduces condensation. Wool can absorb up to a third of its own weight in water vapour without feeling damp. It wicks away the excess moisture generated by showering and cooking. Less condensation means less mould to cause respiratory problems. A springy wool rug is easier on your joints. The fibres have a natural crimp that coils and uncoils as you walk on them. Your rug cushions your joints as you walk and softens any falls. Wool also acts as a natural air filter; it can absorb indoor contaminants and remove harmful gases from the air you breathe. When choosing a rug, don't just think about the overall style of your design scheme. Take other factors into account: the available light, the purpose of the room, and how many people are likely to walk through it (the traffic levels). Each material and weave has its own unique characteristics. For example, pure silk, bamboo silk, and art silk (rayon) are good reflectors of light. They're suitable for darker rooms and for bedrooms because they're so much softer on your feet. And if you're looking for sheer luxury, nothing compares to silk. Wool�s longevity and its ability to retard flames make it an excellent choice for high-traffic areas, while New Zealand wool�s exceptional purity is a superb material for designs involving lighter colours. If you're still not sure, why not talk to us. At Rug Couture, we give you a choice of numerous materials, effects, and 480 colours as standard. That's just the start. If you prefer to have your own special material blend, your own weave, dyes, or other effects, we can help. 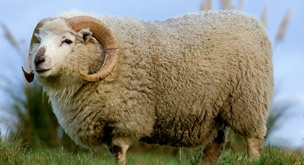 Wool comes in a range of grades, depending on the variety of sheep and country of origin. Rug-buyers who demand the most luxurious grades choose New Zealand wool. 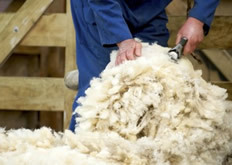 New Zealand wool fibres are naturally the whitest and the softest. When dyed they reveal an extraordinary beauty, clarity, and depth of colour. All Rug Couture rugs are available in New Zealand wool. A handmade rug is a statement about heritage and craftsmanship. Master rug-makers don't work in isolation. They bring generations of experience to their craft, combining traditional skills and processes with modern digital technology. Each project results in a superb one-off rug of unequalled quality � a rug that looks and feels fantastic, and which will retain its natural lustre for years when properly cared for. Your handmade Rug Couture rug is rich with authenticity. It expresses the heritage of the area in which it was made and its maker's appreciation of the strengths of the two methods of production: hand-tufting and hand-knotting. Although technology is involved, bespoke rug-making is not an automated, mechanised process; it's an art form. Handmade rugs arrive in two distinct weave styles: hand-tufted and hand-knotted. Hand-knotting is the more skilful and time-consuming process. The style you choose depends on the effect you want to create, the complexity of your design, and the location of your rug. Our most popular rugs are custom hand-tufted. They reveal a high-quality, uniform finish, which makes them especially well-suited for time- and budget-sensitive projects. Hand-tufted rugs are durable and easy to clean, and we can make them to any size and shape and in varying thicknesses of pure wool or New Zealand wool. Our team of skilled rug-makers combine modern and traditional processes to create your hand-tufted rug. They scale and enlarge your chosen design to create a �graph' of the pattern, which is printed onto canvas and stretched across a frame. The master rug-maker then uses a tufting gun to punch thousands of loops of dyed wool, art silk, or silk through the canvas. By following the printed pattern, he creates your finished rug. He then applies a latex coating (known as a �scrim') to the reverse. The scrim holds the tufts in place before he attaches a final protective backing of natural cotton. The final stage is to shear off the upper layer to create a super-smooth and even pile. Depending on the design, he will then hand-carve the surface to accentuate elements of the design and create a superior finish. For an exceptionally durable rug and an unmatched lustre , choose hand-knotted. Hand-knotted rugs tend to be thinner and denser than hand-tufted rugs. Our craftsmen are so skilled at hand- tufting, they can now offer wool densities of up to 232,500 knots per square metre in New Zealand wool. At this density, you're getting a true heirloom piece. By using technology, we can also recreate your own designs in New Zealand wool, art silk, pure silk, bamboo silk and more as single materials or blends. Through our bespoke service, we can also add textural effects such as hand-carving or loop-cutting. Hand-knotting is the world's oldest method of rug-making. It originated in Central Asia over two thousand years ago. To create a hand-knotted rug requires exceptional skill. The process is detailed and time consuming: each knot is tied by hand to cotton threads wrapped around a vertical loom. The knots are so secure, a hand-knotted rug needs no latex scrim or backing material. Your hand-knotted rug is the equivalent of a piece of woven art. To achieve such a sublime finish, you need an extremely skilled craftsperson � someone with the experience and ability to bring your chosen design to life. It takes years to develop the natural affinity that exists between the weaver and the design. It's a highly skilled and labour -intensive process; it takes time to produce, but your hand-knotted rug is always worth the wait. We wanted to give you the freedom to create the rug of your dreams: the rug that you could find nowhere else apart from Rug Couture � the exact size, exact style, and exact colours that fit your room. Imagine being able to match a rug to the subtle shade of blue of a much-loved piece of ceramics. Or maybe you have your heart set on something a little bit different � a wild and vibrant design that would be the talking point of your room. Why settle for something that's almost � but not quite � right, when you can have the rug that's perfect in every way? With custom-made rugs you get complete choice. You get the rug that's yours and yours alone. And through the automated design process of our online store, you have the freedom to experiment and to choose. You get so much more choice over shapes, colours, designs, and sizes than you'd have in a physical store. It's less work too. No trudging from store to store, no leafing through endless catalogues; every design tool you need is on the screen in front of you. This is genuine creative freedom: go plain, but in a much more sophisticated colour, or choose from hundreds of designs in almost every conceivable colourway . Or get in touch for something that's completely bespoke and utterly you. A custom-made rug is also the best fit for your room. You pay for the size that you need, not the size that the manufacturer has chosen. To help you decide how big your rug should be, we've written a Size, layout, and fitting guide, or you can choose from the lists of popular rug sizes on our website. Finally, through our bespoke service, we can translate your own designs, in any of these materials, and also offer art silk (rayon), pure silk, bamboo silk as single materials or as blends. To commission your own design or discuss a bespoke order, please get in touch.